When I volunteer to “bring something,” my contribution is invariably an “old chestnut” whose outcome is never subject to question. For July 4th, a chocolate cake seemed the logical all-American choice. Given a miserable heat wave and the three loads of wash in progress, you’d think I would simply have thrown together my go-to, never fail “easiest chocolate cake.” But in a wave of what I can only characterize as heat-induced madness, I didn’t. I found a similar recipe in my Canadian Living: The Ultimate Cookbook—which had never disappointed me—and went for it, fully confident that it would be perfect and delicious. I can’t blame the recipe because I took liberties with it. Forgetting that chocolate cakes are typically sturdier, I used the Southern-style soft wheat flour on hand, whose selling point, delicacy, is probably the polar opposite of the texture I would have gotten otherwise. Still apparently in that heat-induced fog, I sifted instead of whisked. The batter was gorgeous, but the cake split in the last five minutes of baking. Meanwhile, despite having the AC at full tilt, the whole house felt dense and muggy. I took the cake out, confident that I could cover the veritable gorge sufficiently with icing. The cake was supposed to be cooled for 10 minutes, then inverted on a rack to cool completely, and inverted again on the serving platter to ice. I wouldn’t normally do this for a picnic–I would just leave it in the cake pan—but I wanted it to look nice and thought I’d give it a go. I think you know what came next: the deconstructed chocolate cake, a messy plate full of crumbs and broken pieces. There was a time when I might have burst into tears, but at this point in life, I have finally learned the virtue of keeping calm and carrying on, as the saying goes. Plus, I knew I could rely on Martha Pearl. My Mother’s Southern Kitchen was the first cookbook of the southern collection that I started back when Nathalie Dupree had a southern cooking show on the then-new Food Network. 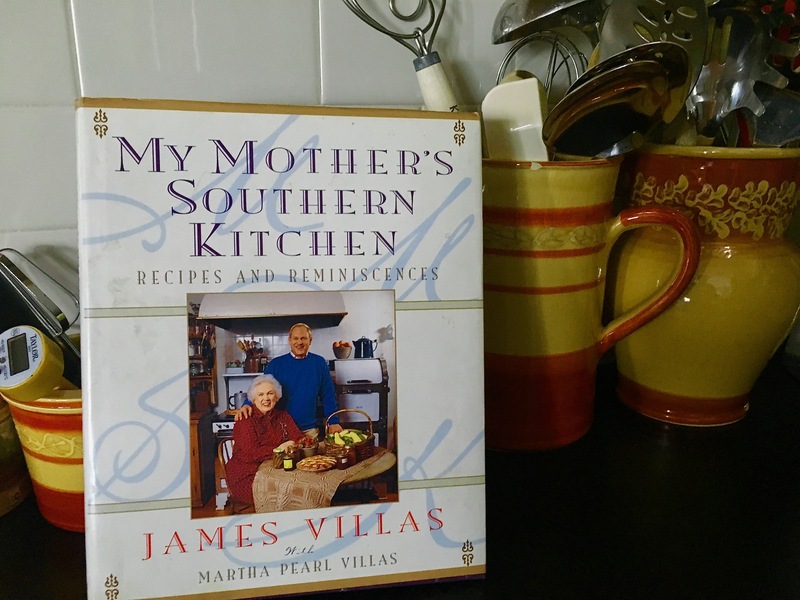 James Villas’ book is a loving compendium of his mother Martha Pearl’s recipes, the best of which is her coffee cake. I threw it together in no time at all, as I’d done a week or so ago for a neighborhood event. This time, I knew that the soft-wheat southern flour would be perfect. I substituted buttermilk for whole milk, and threw in some fresh blueberries instead of walnuts. I suppose you could also use butter instead of shortening, but shortening does something lovejly for the texture, so I never mess with it. Martha Pearl’s coffee cake has a cinnamon streusel topping. The coffee cake was a hit, as I knew it would be. Unless you leave something out, it’s one of those perfect old chestnut, never-fail cakes—as Villas describes in the narrative. We’re munching on the deconstruction today, while I look for ways to “repurpose” it. I’ll update you if I find something. Such a great idea—never occurred to me! Glad it all worked out. I think it’s hot everywhere…. Absolutely a trifle. Especially when there are going to be kids eating it. Great pictures! I totally agree with the others that a chocolate trifle is the way to go.